When my alarm went off at 4:50 Saturday morning, I’d barely slept. Will and I are generally pretty spoiled; our toddler – who turned one in late January – usually sleeps through the night, but lately we go to sleep wondering if Grady will wake and need snuggles to return to his slumber. Friday night was a bit different because earlier that day I’d decided to drive up the beach Saturday and walk across the new bridge over Oregon Inlet. Although, making that decision did not happen immediately. As local newspapers began promoting the event, I became more and more interested. I spent the latter part of last week talking myself outof making the drive up, but then Friday morning a visitor asked me if I was going. That question made me reconsider AGAIN and by noon I had set concrete plans. Will was able to switch his Saturday evening shift at work with another Zillie’s employee, and I anxiously awaited the opportunity to tell my parents about our last-minute adventure. We were all set to catch the 6:30 ferry the next morning and make it to the Oregon Inlet Marina by 9:30, where the public was directed to park, well before the 10 o’clock start of the ceremony. In an effort to wear myself out a bit, after work I took Grady on a walking adventure to the Post Office (we do this most evenings), where I excitedly told whoever would listen that I was going up to see this new bridge. For anyone who knows me, this probably isn’t a surprise. For those of you who don’t, I’m a bit of a live-wire, and when I get excited about something, I reallyget excited. And that excitement generally means I’ve just gotto tell someone. We made it home before the sun had completely set (I’m a very efficient walker when fueled by excitement), and Grady promptly fell asleep. This was the beginning of our restless night, but I got extra time to cuddle our sweet boy, which was wonderful. I knew it was going to be windy all day Saturday and as I got snuggled under our covers, my mind began to wonder. What would happen if a strong gust of wind ripped the stroller from our hands? What if the guardrails weren’t very high or (even worse) weren’t completed? In between bouts of my mind running wild, I read The Dark Side of Camelot because nothing like reading about corrupt politicians to put your mind at ease, amiright? I finally drifted off to sleep just as Grady awoke, crying tiredly. Will lulled him back to sleep, though he tossed and turned for the remainder of the night. We’re fairly certain, based on the amount of food he consumes, and his achy cries that he’s going through a growth spurt. So, when my alarm went off at 4:50am, guess who was bright-eyed and bushy-tailed? No one! But we got everything together, fed the baby, let the dogs out, showered, packed the car, poured our coffee, and left right on time to pick up our travel companion, Vicky, at 5:50. The drive to ferry was dark and sandy. Sand that had been blown off the dunes accumulated on the pavement, covering parts of the highway at the north end, and I could picture the tiny specs of paint being chipped off our vehicle with every grain of sand that battered it. But the ferries were running and that was all that mattered. There weren’t many vehicles on the 6:30 boat, so we thankfully weren’t parked at the very front. The ferry was rocking back and forth and the wind, forecasted to blow at least 20mph, was making the ride eventful. As we made our way into the inlet, large waves – by no fault of the captain - crashed over the front of the ferry, sending large drops of saltwater onto our car and all over the deck. In between the salt water sprays, I carefully and quickly jumped out of the car to take photos of the sunrise, which, just like most Outer Banks sunrises, did not disappoint. 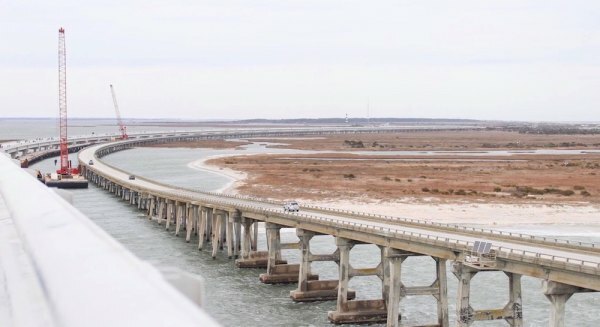 Shortly after I returned to our vehicle – windblown and cold - the captain turned the ferry so sharply it felt like we were going to make a pinwheel, but that turn made the rest of the trip over to Hatteras smoother and significantly less wet. The rest of the trip up was uneventful. We stopped in Avon to use the car wash, and then made a quick stop at Food Lion to grab breakfast before completing our journey. By the time we reached the Pea Island National Wildlife Refuge it was 8:30, so my plan to arrive well ahead of schedule and secure a parking spot at the Oregon Inlet Marina was unfolding perfectly. When we crossed over the current bridge, my excitement bubbled over. Traffic was so light you wouldn’t have believed a bridge dedication was about to occur, and when we drove past the parking area, I knew my suggestion to leave super early was a smart one. The National Park Service had employees and volunteers strategically located to direct traffic through the marina parking area and answer questions. They efficiently guided motorists to available parking spaces and offered the use of shuttles to anyone who needed or wanted assistance getting to and from the bridge. As I put the car in park and turned off the engine, I realized the forecast calling for high wind all day was accurate. Our sedan was parked so the wind was hitting the driver’s side of the car, shaking it with each gust. Around us, people were struggling to get bundled up as the wind blew coats and scarves up and out, and made getting on hats and gloves a challenge. We didn’t fare much better. After covering my ears with a fleece headband and with a, “Here I go!” I pushed open what felt like a 2-ton car door (thanks to the wind trying to keep it closed), exited the car, and promptly froze as I struggled to zip up my green rain jacket/windbreaker. Will and Vicky weren’t far behind me. I pulled the stroller from the trunk and attempted to get Grady’s plastic weather shield situated before yanking our sweet boy from the comfort and quiet of the car. We quickly figured out that placing the stroller on the passenger side of the vehicle would make things far easier than fighting the wind on the other side. Grady sits behind the driver, so we bundled him up before taking him (secured in his car seat) out into the wind. He didn’t seem to mind too much. He did grimace a bit at us, but that expression quickly melted away once we encased him with the plastic weather shield. Then, off we went! We walked out of the large parking area, past fishing boats docked at the marina, and into another smaller parking area located closer to the bridges. Here is where we found a large clear vinyl tent that was going to be used for the ceremony. We situated ourselves along the inner perimeter of the tent, not wanting to sit after being in a car for a few hours. People began standing in front of us, and I (politely) made it very clear I was going to get photos one way or another. To my left, a man who was obviously a serious photographer kept getting his view blocked. I leaned over and offered to switch places since I had secured a good viewing window, then promptly asked, “Wait, who are you?” He replied, “I’m Daniel Pullen,” and I was about as star struck as someone could be! I told him how much I enjoyed his photos, and then asked if I could take a photo with him. He was kind enough to let me do so. As the ceremony was gearing up to begin and the speakers made their way to the podium, I only recognized one: Dave Hallac, Superintendent of the Parks of Eastern North Carolina. The other speakers all served a role in the bridge project, but two women really stood out. Referred to as “The Bridge Moms” several times during the ceremony, it became clear Beth Midgett and Natalie Kavanagh were vital to the project from its beginning to its completion, having fought tirelessly to have a new bridge constructed. As the ceremony began coming to a close, one speaker mentioned the wind and how fitting it was to have an Outer Banks blow on a day as meaningful as was Saturday. The tent seemed to empty fairly quickly, and as we made our way to the new bridge you could feel the electricity radiating from everyone. We could also feel the wind. 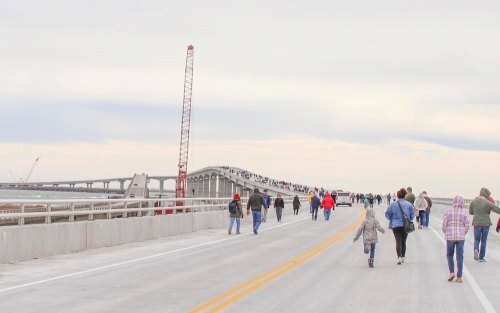 People on bikes and on foot, babies in strollers, children running gleefully ahead of their parents, people in wheelchairs and scooters all quickly made their way onto the bridge. The wind was at our backs, propelling us forward and up 90 feet above Oregon Inlet. It also blew the hood of my rain jacket/windbreaker around, creating what seemed like quite a racket! I felt like I had to yell to be heard over the wind, and I could barely hear what anyone was saying to me over the wind andthe movement of my hood. But, I’d never gotten to see the Sound, inlet, and ocean like this, so I really enjoyed snapping photographs of not only the bridges and people, but also the scenery I often miss while driving 55mph. Along the gradual ascent to the top I noticed broken oyster shells – the sea gulls were taking advantage of the new concrete – scattered around the lanes, more cormorants than you could shake a stick at on a sounds-side sand bar, and the large area of marshland on the eastern side of the bridges. As we reached the top, I enjoyed seeing the United States Life Saving Station on the south side of the inlet, another view I don’t often get to enjoy while traveling over the bridge, and noticed how small and rickety the old bridge seemed in comparison to this new mighty structure. I’m not a big fan of bridges, mainly because things can fall off or through them, and I get so worked up at times that might dad composed a song about it. 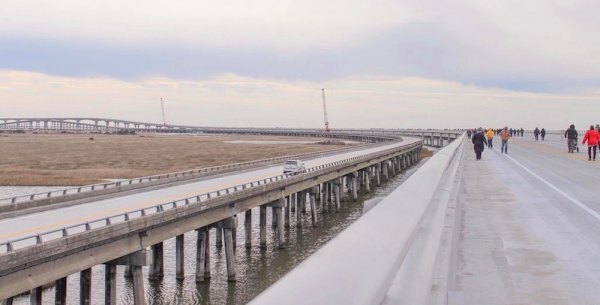 I love driving, and do most of it when Will, Grady, and I travel, but those few minutes across the Bonner Bridge are usually met with great unease. And can we just take a second to acknowledge how horrible the sea gulls are? In case I don’t worry enough, I also have to navigate around these birds with a death wish that don’t seem to comprehend the perilous position they’ve placed themselves in by flying INCHES FROM MY WINDSHIELD! I fear this new bridge will prove to be just as nerve-racking when it comes to the sea gulls flying around at the top. I think it’s fair to mention at this point that Grady was sleeping soundly as we walked up the bridge. Through all the wind, conversations, vehicles (shuttles and a few NCDOT trucks) driving by, screams of joy, screams indicating a lack of joy, through all the sounds around us and created by us, Grady slept through all of it. When we took turns having our photos taken at the top, Grady slept. When the wind gusted and blew us about, Grady slept. When Will and I were using raised voices (in a non-combative manner) to communicate (I want photos to be just-so), Grady slept. After a few minutes at the top we’d had about enough and as we turned to head north, the wind reallygot us. On the ground the wind was reportedly a steady 23mph, so going up 90 feet in the air certainly added a few miles per hour to that. Trust me when I say it was windyyyyyy. I’ve recently taken up jogging, and have been suffering with shin splints. The wind on Saturday was so strong and so cold my shins went numb; giving me some much needed pain relief. Talking became a challenge as the wind blew cold air on the little bit of skin we had exposed. And pushing the stroller was quite a task! And Grady slept through all of it. The trip going back to the car seems like a bit of a blur now. I was so focused on keeping pace and the stroller from going off course that I barely looked up! As we neared the bottom, we ran into a family we know and chatted with them for a few minutes before making our way off the bridge and down into the small parking area. The NPS volunteers and employees must have been frozen; we were lucky enough to be able to maintain some warmth by moving, but it didn’t appear as though the people directing traffic and answering questions moved much. When we got back to the car, it felt so nice to get out of the wind. I didn’t even care about the cold temperature inside the car. Don’t get me wrong, as soon as I started the engine that temperature dial went to the hottest setting possible, but the initial break from that cold wind was super nice. Wind-blown and tired, in silence we made our way south. As we drove over sand that had stretched across Highway 12 through Pea Island I heard a whistling sound I’d never noticed before. It was kind of eerie until I realized what it was, and I’m guessing I hadn’t noticed it in the nine years I’ve lived here because I typically have music playing in the car. On the way we stopped at the Subway in Avon to get dinner to go, and in Frisco at the charming Pamlico Deli. A short time later we got to the ferry and headed for home on the 2pm boat. I was anxious to get back to the house to look through the photos from our off-island once-in-a-lifetime adventure. But we learned quickly our windy adventure wasn’t done with us when, en route, Will tried to exit the vehicle, only to have the wind grab the door and smash it into the side of the ferry. I suppose that’s a hazard of living in paradise. The event Saturday was clearly well-planned and organized, and the people involved in the bridge project and preparations did a wonderful job. I really feel walking over this bridge on its dedication day was once-in-a-lifetime opportunity (they say this is a 100 year bridge), so I’ll be long gone by the time a new one is built. It was absolutely worth the trip. And Grady slept through it all.